Underpressure winner of this years One Lap of America, posted up some results of testing with the Haltech ECU on the Nagtroc forums. 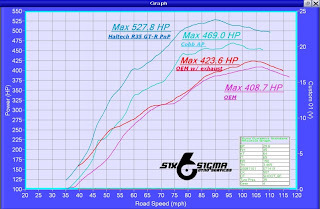 The standard stock car came in with 408 hp , a Cobb Accessport tune came in at 469 hp, and the Haltech ECU came in with 527 hp, all on BP93 octane fuel. These are all repeatable runs. Cobb and Haltech runs were at the approx the same boost level. Cobb was a little bit higher actually. Early July for a realistic release date. Taking pre-orders now. 50% down. There are no official pre-orders thru Haltech. Would suggest running it with the Haltech dual channel wideband for closed loop.